Warp: Linen and wool pattern weft on a wool warp in slit tapestry technique with some curved wefting. 14-15 warps/cm. Colors: Brick red, brown-black, beige, olive brown, rust red. 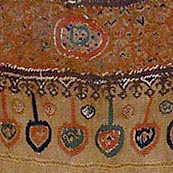 Tunic border with a pattern of 3 complete male figures carrying ducks moving briskly rightwards, cloaks flying behind them. An upper border of small roundels enclosing flowers, and a wide lower band of lappets and palmettes; finishing with a narrow vertically banded stripe. Remains of the top end finish of warps returned over 2 cords. The figures with their large, round staring eyes, pompador hairstyles, lively poses and flowing classical garments all are consistent with a 4th century date, as are the saturated and widely ranged colors.